Mauritius - Blog from Bel Ombre, Mauritius | Margaret in Wonderlands..
We were up on the Tues at 6.15am for our 8.30 flight to Mauritius. We flew up to Jo'burg which took a few hours. We had a KFC at Jo'burg, have to sample the foreign take away foods. It had a spicy salt on the chips which was nice. We waited to get through immigration which took forever, can't rave about the customers in Jo'Burg as it was slow on the way out. Some guy with his family proceeded to push the queue and then slow it down and the second other officer left the box so we were stuck! We then went to our gate to wait. I went and got a post card using the last few rand. We then got on our 4ish hour flight to Mauritius. When we got to the queue for immigration in Mauritius I suddenly remembered I hadn't seen our money wallet for a day or two and frantically checked my bag but it was nowhere to be found. It had €70 euros for transfers, £100 and my bank card and driving license. I was so annoyed as seemed bizarre it had gone as I had it in Knysna. We then had a long queue at immigrations (again) and after a while we moved to the other queue as that was going through faster. We did get talking to a nice SA couple who were off on their holidays and produced peaches for the UK for Waitrose and M&S. When we got through we found our driver and headed for a cash machine to get some money out. He was a bit crazy, speeding around, overtaking vans and I felt glad to arrive at the hotel Heritage Awali. After a quick intro the receptionist told us to go eat and catch the curry buffet before being shown to our room. I felt absolutely knackered as this point as we had been traveling most the day and I just wanted to go to our room. After we ate some food we checked in and were shown to our room. They had given us a t shirt and sarong and put petals on the bed. We had a fully stocked mini bar which was free for us to use. It was a lovely room and had a nice balcony area which looked out to the sea with a pool in it. I pulled my bag apart and there was still no sign of the money wallet so Rich said I should cancel my bank card, which I did just in case. The next day we went for our buffet breakie, I ended up eating pancake, waffle, bread with hams and cheeses, eggs and some other random bits which became the norm most the week! When we were packing for heading out Richard found the money wallet in his bag!! SO happy it was found but annoying as I had cancelled my card! We booked our restaurants for the rest of the week, we booked into the Indian twice, beach club for buffet, Italian and Infinity Blue. We then headed for the pool and found a spot. In the complex there were some lovely looking pools which looked more for sure then use but you could use them. There was the one near the bar which was for adults only and the one our room looked out onto which was for kids and didn't get as much sunlight. Both were really close to the beach front. It was sunny for a while before it clouded over and rained a little bit. This was consistent throughout the week, sun then random showers! For lunch we ate in the bar and we got stuck into our first cocktails, I tried a blue Hawaiian. You could eat lunch there or in Infinity Blue. There were a load of birds around, little sparrows but the bigger black birds with yellow beaks and one that looked like a woodpecker. They were often in the breakfast room or bar scavenging for food. Later that night we went to Infinity blue for dinner, it was set near the beach. I had a prawn dish to start and veg gnocchi for the main, it was lovely!! I had a cocktail which was creamier focused. Rich went for some red wine. It was lovely as you got all the nice treatment you expect in a restaurant. Also they bought out a selection of breads which were yummy and I ate so much bread there as they brought loads out before our meals. On the Thursday, I woke with a sore throat which was not a good sign of things to come. It was absolutely pouring it down but luckily I had the foresight to book in our massage for 9am which was for 45 mins. You had to choose a colour from a choice of about 6/7 and we choose the red one which was about the heart I think. It was very relaxing compared to the SA one. We then went and sat in the bar and decided to do the quad bikes that afternoon. The rain cleared up about 12 and we were meeting for 1 to be picked up! We had to wear longish trousers and proper shoes. We were taken to the Frederick national park which had a golf course, the trip cost about £75. There were about 4 quad bikes and a buggy in the group. The drivers had to do a quick test before we set off, I thought I would get a test but we set off. We went through the park, through fields of sugarcane, spotting stags to a look out and stopped and took some pics at a lookout over the park and out towards the sea. After this we drove for another 15 mins to the waterfall and had to climb up into it through all the really wet mud from the earlier downpour! We were filthy at the end of it, we got some lovely pics there and headed back. We were gone for around 1.5 hours on the bikes. When we got back I asked the woman cleaning the cars to wash down my shoes which was a good idea of Rich's. We then got back and went and sat on the beach but the weather was really on and off so not great sunbathing weather. Later that night we went for an Indian, it was so delicious. Our florist had highly recommended the Indian. I had these kofta for starters and then the chicken tikka for main and a dessert. I had 2 Bombay surprise cocktails with it. The restaurant was really bright and colourful and very small and it was quite empty seeing as it was hard to get booked. After taking some pictures and enjoying our meal we went back to the room and we watched Ant Man. On Friday we missed out on a pool spot which upset Rich as he prefers the pool so we went and sat on the beach for the day. For lunch we went to Infinity blue which was lovely overlooking the gorgeous sea. We asked to be moved to a spot that became available closer to the view of the sea and some rude woman went and sat down even though the waiter explained we had asked to sit there (Honestly some peoples manners or lack of, is unreal) I ordered a chicken and prawn curry which came in little pots with a rice pot, it was delicious. Rich ordered a pizza! We went back to the beach but the weather was unsettled later that day so we went for a walk on the beach to left of the complex. We wandered past more hotels and a little walkway out into the sea with a little shelter and took some pictures. It was so windy, our little resort must have been blocked from that wind. On the way back it started to rain so we headed inside to the bar. They were doing 4pm crepes so we had one of those and some drinks. I felt terrible with the cold by now so we went back to our room. Later on we walked across to the C beach club on the beach which was at their sister hotel. It was a nice looking restaurant and it was Chinese buffet night. I felt pretty awful sneezing away so didn't eat as much as normal (which could only be a good thing). After we finished we got the shuttle back to our hotel. On Saturday we reserved our favourite spot by the pool side. I was a bit of a mess feeling terrible so Rich went and got me a wet flannel. One of the guys called him a wonderful husband J We stayed here all day. On our honeymoon, I ready about 6 books. 2 actual booked and the rest on my kindle. I love to read and on holiday is the only time I get to indulge in that. We went to the bar to have lunch. After about 35 mins we were wondering where our order was. Turned out 3 other couples had the same problem. The waiter had forgotten to put the orders in we think. After one couple complained, we pointed out about our order and it came within 15 minutes. After lunch we went to the beach. I fell asleep and when I woke up there were a couple in wedding gear having pictures taken. Rich said I would have been in shot, lucky couple! It was cute watching them have their pics taken and I bet they looked gorgeous once developed. Later that night we went to the Italian for our dinner. It was only opened certain nights and didn't have pizza on the menu which was surprising! I had the anti-pasta for starter and open seafood ravioli for mains, it was very tasty! After dinner, still feeling poorly we went back to our room and watched the expendables 3! Rock and roll!! On Sunday at breakfast I finally ran into Tara at breakfast. She got married a week behind us at the same venue and bizarrely was at the same honeymoon spot as us! We had a little catch up and then went to have breakfast. We went and sat by the pool again and I braved the cold pool! They were really pretty looking pools but it wasn't really hot enough to warrant jumping in regularly. Later again the weather dipped a bit so we went for a walk to the right of the beach. We went past the sister hotel and the water sports place. There were quite a lot of kite surfers and water skiers! There was a large reef around the bay and the waves looked massive so I would be scared I would get pulled into it if I tried kite surfing. Later for dinner we went for buffet, I had a mix mash of food including pasta meat, salads, pizza….the list goes on! Of course this involved more cocktails. There were so many on the list so I wanted to get my money's worth and try as many as possible. 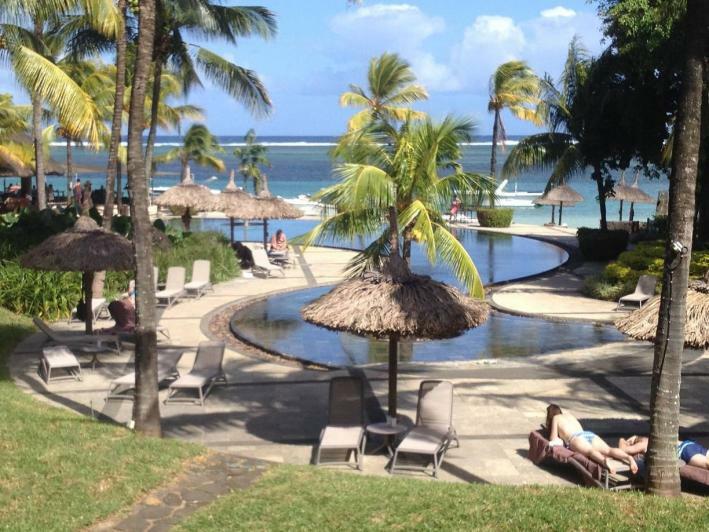 Monday was our last full day in Mauritius L We spent the day by the pool in our fav spot!! We decided to do our glass bottom boat trip that afternoon and we ran into Tara and her hubby Steve. It was good to talk about our weddings and see how their day went! We didn't see much in terms of coral and fish but there were a few and then he took us closer to the waves! Really cool but scary. It was only a 30 min trip so nice to do it. When we got back we had some lunch, I tried the burger which looked epic! We were having a late 9pm sitting at the Indian restaurant so needed to keep full until then. We finished off the day on the beach and watched the sunset which was pretty. The sun was setting around 5.40 so quite early. We then went back to our room to pack. Home was calling L We went to the bar for a few cocktails before dinner. We took a few picture and one of the cheeky waiters kept photo bombing us! For dinner I had the chicken tikka starter and seafood curry. We also ordered a main of saag paneer, saag aloo and extras to share so we were being ultra greedy. Again it was delicious. Later that evening I saw the Fodens had posted a picture on their facebook page of me and Rich, soon after they sent us the link for our wedding pictures. It was a lovely way to end our honeymoon. It was so fun seeing the final shots of our special day.